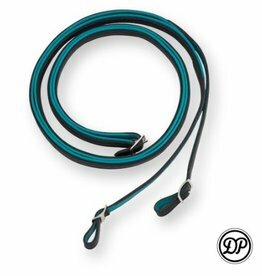 Lunging Cavesson Soft Feel by Deuber and Partner is a beautiful bitless bridle made from the finest and best quality leathers. Available in many colors including two-tone. This makes it possible to create this Soft Feel cavesson in the color combination that suits you and your horse. The anatomically shaped headpiece ensures good pressure distribution and leaves the ears free. The jaw strap prevents sliding of the cheekpieces in too the eyes and displacement of the noseband. The nose part is softly padded and has 3 movable rings. The reins are available separately and can be ordered in the same color combination as your chosen lunging cavesson. Lunging Cavesson Soft Feel is made of smooth leather that is available in different basic colors. For the soft padded areas, you can choose Nappa leather or Nubuck leather in many different colors. The cavesson can be finished with silver and golden buckles and closures. Nappa leather: This is the grain leather and widely used for the softly padded areas of the bridles. Nubuck leather: This is smooth leather that is roughened to create a velvety appearance.